SATA Hot-Swap Mobile Rack enclosure with instant H.D.D. installation, hot-swap ability, and unlike any other units you will ever encounter. SATA Hot-Swap Mobile Rack has made it simple, easy, and convenient to maximize your storage capability. In addition, the SATA Hot-Swap Mobile Rack has a key lock built-in, which allows you to protect and safely secure your hard drive. 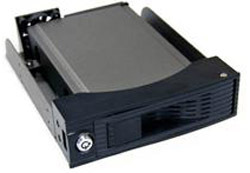 Hot-Swap Mobile Rack comes with a unique mechanism design that is easy hot-swapping your SATA hard disk drive from the mobile rack. It is designed with an anti-vibration system to provide extra protection to your hard disk drive, and a powerful cooling fan and a casing to provide better heat dissipating and dust. It is support Serial ATA I 1.5Gb/s and Serial ATA II 3.0Gb/s compatible. 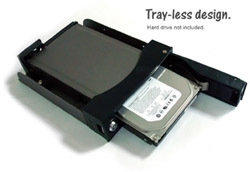 Easy to install in any standard 5.25" Drive bay and compatible with all type of PC cases. Working with 5.25" external enclosure for mobile purpose, EXT-SATA or SATA/USB2.0. Netallic surface for Anti-rusty body. Compact construction and light weight desing. Hot swap operation. Plug & Play. Tool-less design for HDD installation. Tray-less design. Fast HDD exchangeing. Quiet 40x40mm cooling fan provides excellent airflow.